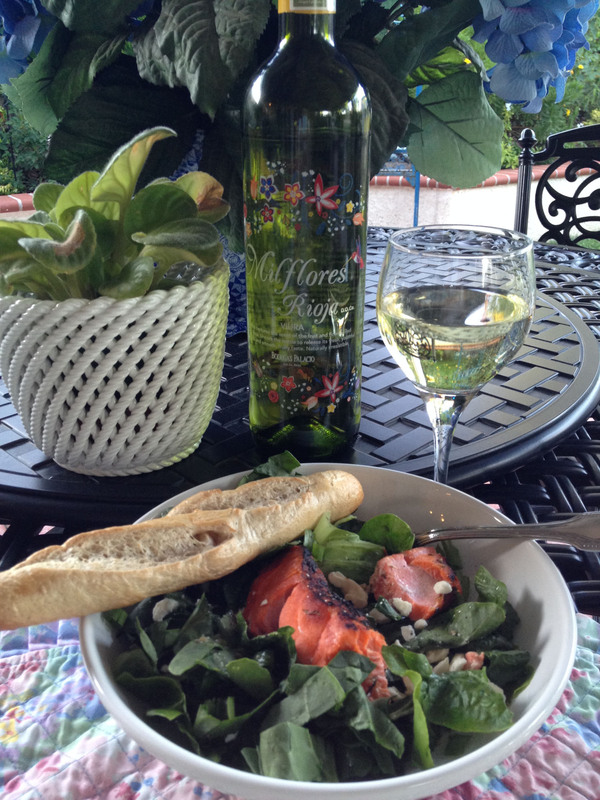 Salmon Steaks and Salad make week-night diners quick and easy! On my last day in the Temecula Valley, we spent the time exploring the surrounding areas and hit a couple of boutiques, thrift shops and antiques stores. Towards the end of the day we stumbled upon a a gourmet grocery store, Farmstead Market. It reminds me of the family owned markets that you’d find in Napa Valley. We spent about an hour just looking at all the great varieties of local produce, meat and dairy items throughout the store. Since we didn’t have any dinner plans for the evening . . . and were in a great gourmet store, why not look around and plan a dinner from all the great choices at this store? How could we go wrong? First, we decided on something simple since we had been on our feet most of the day shopping and since it was my last night, we didn’t want to spend the evening in the kitchen cooking and cleaning. So Andrea walked over to the meat and deli case. Since she is a retired senior butcher from a national grocery chain, she new exactly what to look for in the meat and fish case. “Oh, they have some fresh wild Salmon!” So, dinner was set, salmon steaks. This dish is one of Andrea’s favorite meals at home. It’s quick and easy and not a whole lot of preparation or mess. The butcher wrapped up the fish and we headed over to the produce section and picked up some lettuce for salad. The arugula and spinach looked really fresh and we found a unique lemon vinaigrette to try dress the salad. On the way to the check out, I notice a display of wine being featured in the center isle. 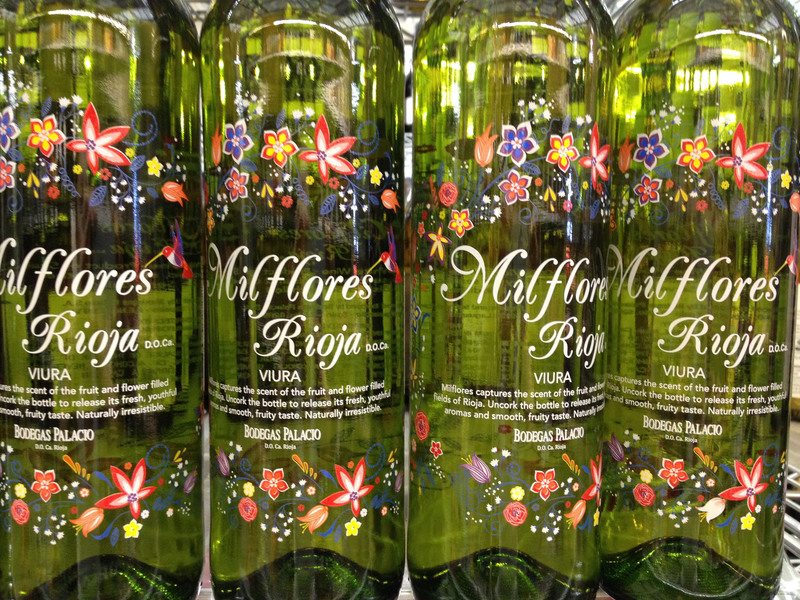 A Spanish red and white wine. The white wine proclaimed to be very light a fruity and the bottle was kinda pretty, too. So I suggested we try a bottle of the white to accompany the fish. We headed back to her house. Andrea and I began preparing the dinner and discussed the day’s adventures and talked about her future plans and ideas for decorating her new home in Murrieta. 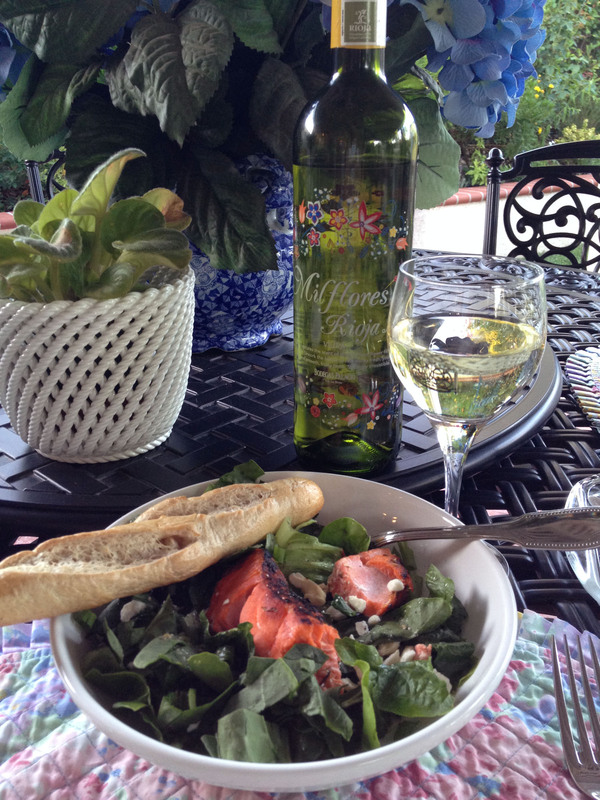 Dinner was done and we took our plates outside to her beautiful backyard garden patio. 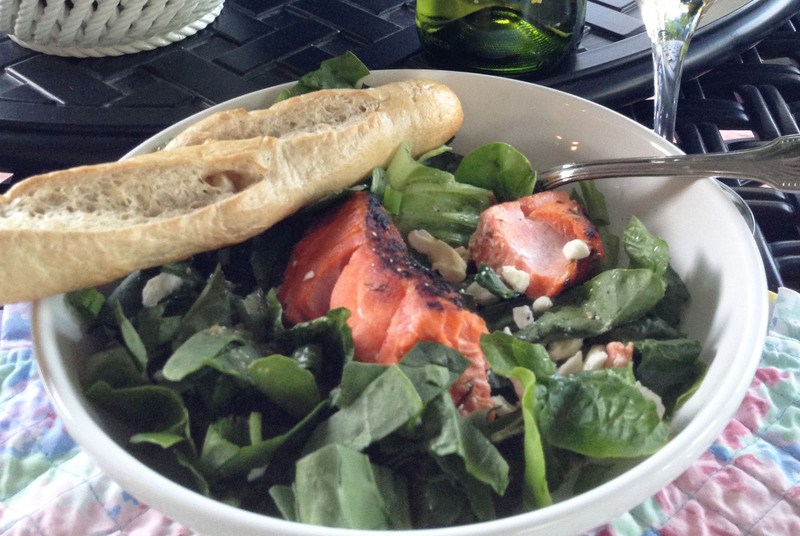 The salmon steaks with arugula and spinach salad, toasted almonds and feta cheese was so delicious and the salmon was perfectly cooked and very moist with its simple salt and pepper seasoning. The lemon vinaigrette turned out to be very good, too. Complimented the fish flavor. I’m sure I’ve seen other lemon dressings that are similar to what we had that night. I may try to duplicate it and post at a later time. But here’s a recipe for it on epicurious.com.http://www.epicurious.com/recipes/food/views/Simple-Lemon-Vinaigrette-51183020 It was a perfect dinner to end a great three days in Murietta and Temecula. Cut the salmon into two 4 ounce thick steaks. Coat the steaks with grape seed oil and season with salt and pepper to cover evenly. Place the steaks on a baking sheet lined with parchment paper or foil. Place the steaks skin side down and cook for 25-30 minutes, or until the steaks separate easily and flake apart in large pieces. Remove the steaks from the oven, cover with foil and set aside. Mix the arugula and spinach together. Add the lemon dressing and toss to coat evenly. Add the feta and almonds. Place on two plates. Place the steaks on top of the salads and finish each steak with a light squeeze of lemon juice. 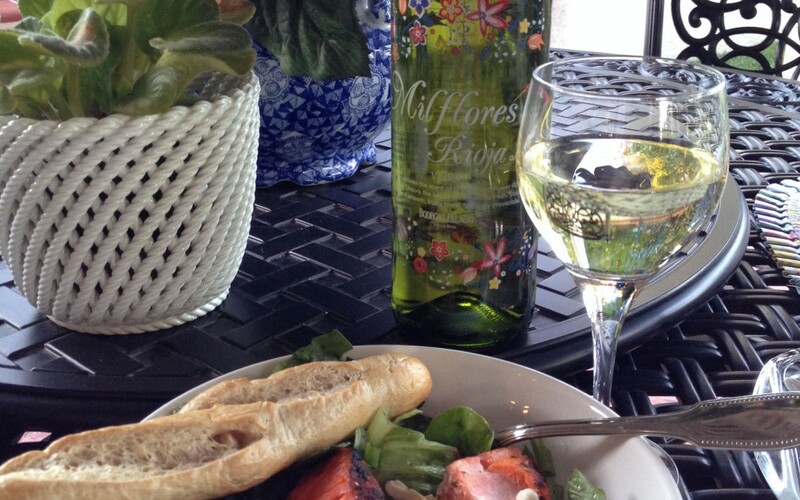 Serve immediately with Spanish white wine, baguette and butter. Fast and easy Broiled Salmon Steaks with Arugula and Spinach Salad, toasted almonds, feta cheese and lemon vinegar dressing. Serve with Spanish white wine, baguette and butter. Step 1 Turn on broiler to High. Step 2 Cut the salmon into two 4 ounce thick steaks. Step 3 Coat the steaks with grape seed oil and season with salt and pepper to cover evenly. Step 4 Place the steaks on a baking sheet lined with parchment paper or foil. Place the steaks skin side down and cook for 25-30 minutes, or until the steaks separate easily and flake apart in large pieces. Remove the steaks from the oven, cover with foil and set aside. Step 5 Mix the arugula and spinach together. Add the lemon dressing and toss to coat evenly. Add the feta and almonds. Place on two plates. Step 6 Place the steaks on top of the salads and finish each steak with a light squeeze of lemon juice. Step 7 Serve immediately with Spanish white wine, baguette and butter.